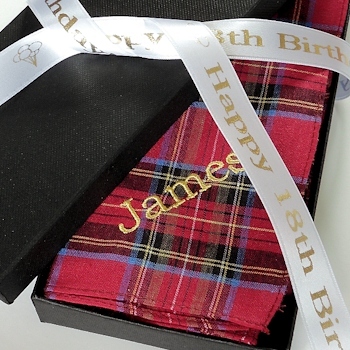 Personalised Pair of Tartan Hankies gift boxed with ribbon. Personalised Pair of Tartan Hankies gift boxed with ribbon. Two Tartan handkerchiefs in your choice of colour with a single name or initials embroidered on them. Select a thread colour and font style for the embroidered text. Tartan fabric colours to select from are: Red Stewart Tartan (as example picture) Blue Gordon Tartan (blue, white, green, yellow pattern) Blackwatch Tartan (navy, green, black pattern) The set of two hankies come in a gift box with a personalised printed ribbon tied around. Greeting ribbon can say who the gift is for or maybe something special such as Happy Birthday!